If you’re on the market for a long distance shooter, eight-year veteran James Jones fits the bill. That’s his job – to hit threes. Jones went on a shooting spree in Philadelphia and sank six of nine from behind the arc en route to 20 points in Miami’s win over the Sixers last week. 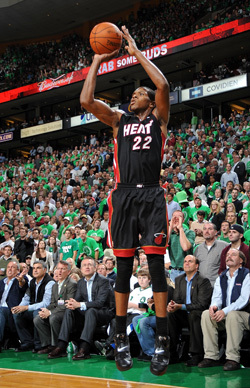 Though he will not put up double digits on a consistent basis, Jones ranks high in three-pointers attempted and made. The tall, athletic forward will also get you a couple rebounds and an assist here and there. Jones possesses a rare ability to come off the bench and get into the flow of the game and hit shots right away. Filling in for Mike Miller, who recently underwent thumb surgery to repair a torn ligament and fracture, Jones is going to get a lot of open looks compliments of D-Wade and LeBron driving to the basket and kicking out. As long as Jones keeps knocking down shots his minutes will continue to increase. But bear in mind that Mike Miller is due back at the beginning of January, so coach Erik Spoelstra will have to decide which of his shooters will keep getting court time.